More like our story. It has become the story of 100’s swelling to include 1000’s who have come together in downtown Oakland. I speaking about the families, elders, youth, workers, teachers, nurses…everyone that I could imagine that lives in Oakland and from our surrounding cities who have come to speak, witness and participate in what has been called the most significant social movement seen in years. No. This is not just a band of disenchanted students camping out in a public park. It’s so much more and I believe that we must either participate or at minimum take note. The challenge is describing what Occupy is, because frankly, Occupy on a national scale is the people who are there. One can’t really know the people unless you are there with us. 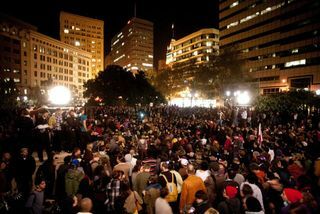 It has been a week since Occupy Oakland hit the international news. The morning the first tent city was dismantled the Occupy Oakland movement was seen by many as not being much. It was viewed cautiously as a movement with no leader, no agenda and by some on the outside, with no point. I had been watching and listening to the community beat. I felt that there was much more here than folks were realizing. The next day at 4pm I joined 100’s of others at the steps of the Oakland Public Library. The People’s Mic was on. For clarification, the People’s Mic is a community based amp – a speaker speaks and the crowd repeats what is said so that everyone can hear. It’s amazing when it flows. The Stack, or the line of people waiting to speak, was stretched down the ramp to the grass. I was joined there by a dear and deeply spiritual friend who believes in the power of spirit in social change. We were there to hold space, to pray to ask for guidance and protection in light of the burst of violence at the Occupy Oakland camp twelve hours earlier. Nearly 2000 people, spanning ages, culture, language, class, gender, spiritual paths, all representing the deep diversity of Oakland and bay area began to march heading west down Jackson street. We passed block after block with the streets to our left blocked off by police officers in full riot gear. Drums were being played, people chanted, some even waved peace signs at the officers as passed they by the police barricades that were “crowd control”. We arrived at 9th street, a few blocks from Jack London square. I looked back and saw dads carrying their children on their shoulders, citizens in wheel chairs, others on bikes and yes a few very few with bandanas covering their faces. In about 10 minutes I would see why that would have been helpful. At 9th and Washington it seemed that the march was heading towards the jail but, a police line blocked the way. I cannot say exactly what occurred at the police line, but one reporter from Oakland Local provided some detail about what may have lead up the events that I witnessed. Popping sounds then a flash grenade landed in the middle of the street – the marchers pulled back just before the first smoke wave hit the crowd. More popping … people running. I remember seeing a father pick up his son running back to safety. We had pulled back just when the second tear gas canister hit the street. We had been dispersed, at least for the moment. This was the first wave of tear gassing by the Oakland Police Department that day. As a witness I did not see any activities that would have warranted the use of rubber bullets or tear gas. I suppose making an attempt to march in the city was threat enough. It was heartening and sad. On the one hand, what I participated in was tremendous. It was amazing to hear the People’s Mic resonating with the words of many who may or may not have ever taken the mic to speak up before. I don’t want to give the impression that I am a doe-eyed naïve first time marcher, on the contrary. I spent quite a few years in third party politics. I know how the “sausage” is made. I’ve spent my years working on behalf of abused children, youth, homelessness and now individual and community well-being. I’ve been to gatherings, conferences, and marches before. There always seemed to be the same contingency present. These always included representatives from nonprofit and/or community organizations that had been pushing long and hard for the rights, care and needs of others. On that day, I was seeing people who I sense were revived from death by burnout after years of disillusionment. I saw others who admitted in conversation would have never considered marching or speaking or being engaged in community change at any level. There were signs, posters, and representatives from multiple missions of social transformation. I’m speaking about labor, health, education and economic liberation. Yes, it was all there in on place and it still is. A quote that has been attributed to quite a few people, nonetheless it certainly captures what I hope will be the future for Occupy. Taking a risk of over-analysis I can reflect on how Occupy fits within Bill Moyer’s model of the Eight Stages of Social Movements. A trigger event puts a spotlight on a problem (or problems in this case) that violates widely held values, sparking public attention and upset. It precipitates massive nonviolent actions and a new grassroots-based social movement. The issue is put on society’s agenda of hotly contested issues in a crisis atmosphere. Yes, it has taken off.